XCA – Optional to store all certificates, requests and private keys. Before we will start with certificate replacement I suggest to begin with editing file certool.cfg in C:\Program Files\VMware\vCenter Server\vmcad. In this file we will provide all information needed to issue certificate. This is how my certool.cfg looks like. 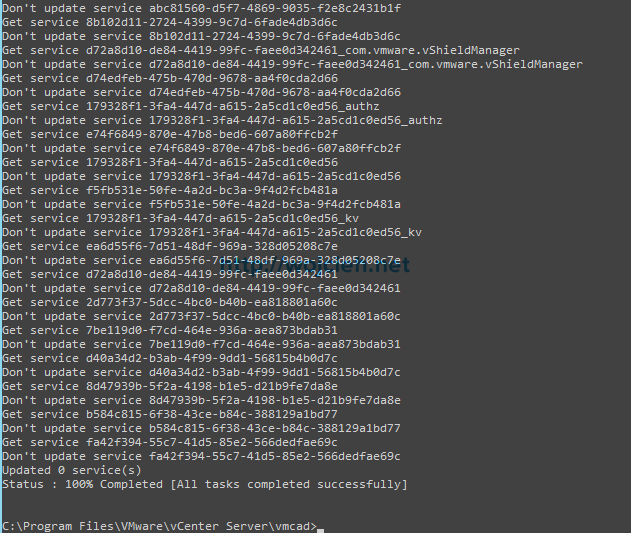 Login to your vCenter Server and start command prompt as administrator. 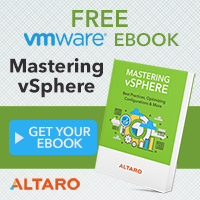 Change directory to vCenter Server installation directory. In my case I have default path which is: C:\Program Files\VMware\vCenter Server\vmcad. Select option 2 and enter Y to use previously edited certool.cfg. Enter [email protected] as username and provide password to this account. Immediately we have to configure first of certificate machine_ssl. It is kind of strange because we were asked in previous step if we want to generate all certificates using configuration file. If you edited certool.cfg file before you just need to hit enter several times. Pay attention that at the end you have to provide FQDN of vCenter Server. 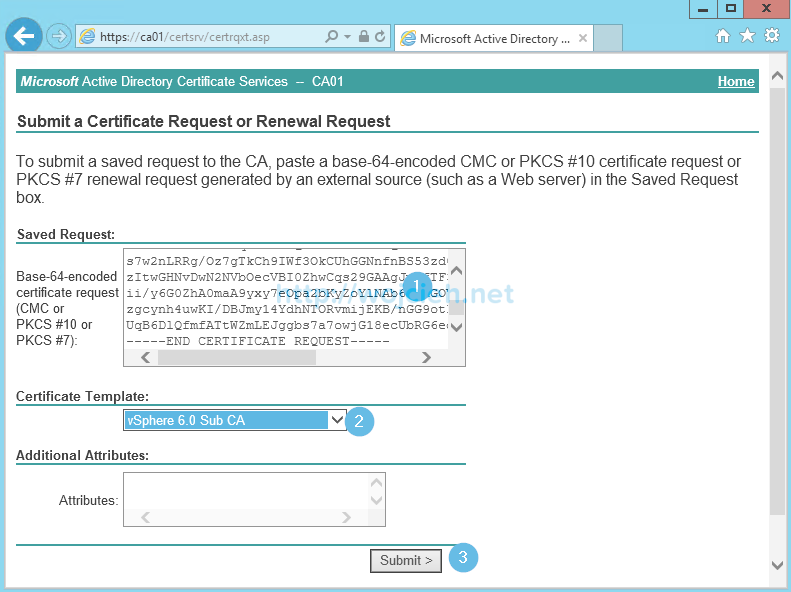 At the end we have to export Certificate Signing Request and Key for VMCA Root certificate. Select 1. Enter directory where all files will be stored. In my cases it is C:\SSL. If you will be asked to reconfigure certool.cfg you can skip it. Once we have files let’s sign them with Certificate Authority. I am using Internet Explorer to sign certificate. Go to https://CA-FQDN/certsrv. Choose Submit a certificate request by using a base-64-encoded CMC or PKCS #10 file, or submit a renewal request by using a base-64-encoded PKCS #7 file. 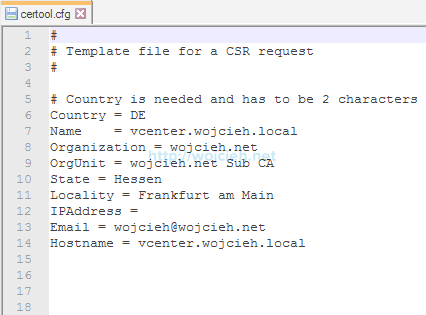 Paste previously generated CSR to field and as certificate template select Sub CA template previously created and click Submit. Once the certificate is approved export it as Base 64 encoded. 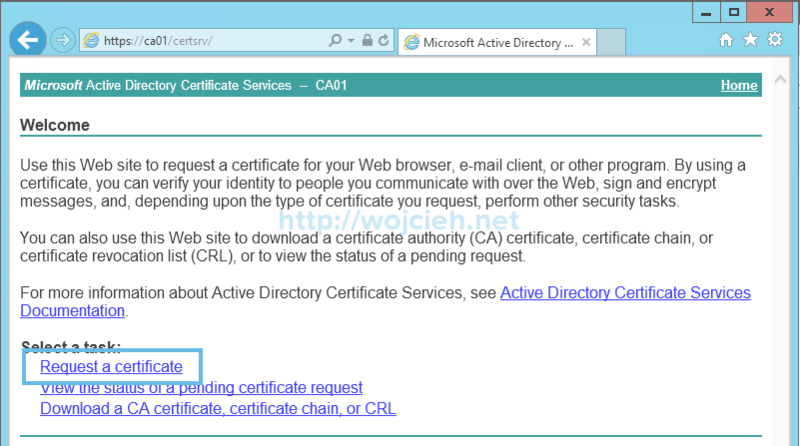 To do it simply click Download certificate. Export Root CA certificate, because we will need it later on. Next step is to combine Root CA certificate (from your Certificate Authority) with Sub CA certificate. Below you will find format how to do it. if everything done correctly you should see that chain is working fine. 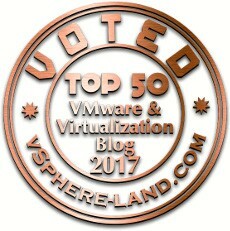 Next step is to import combined certificates (I called them chain certificate) to VMware Certificate Authority (VMCA). 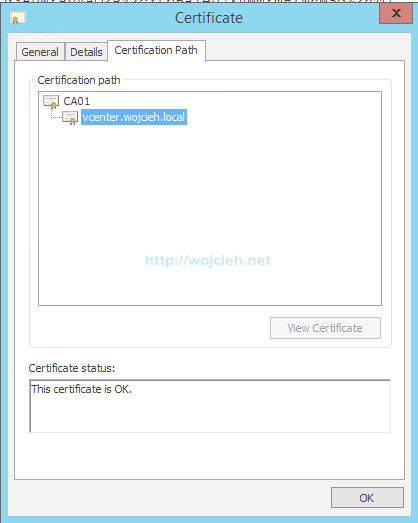 Return to certificate-manager script and select option 1. Provide path to chain certificate and private key. Choose Y to replace Root Certificate and all other certificates. If all steps were followed carefully all certificates will be replaced. It takes few minutes to complete. 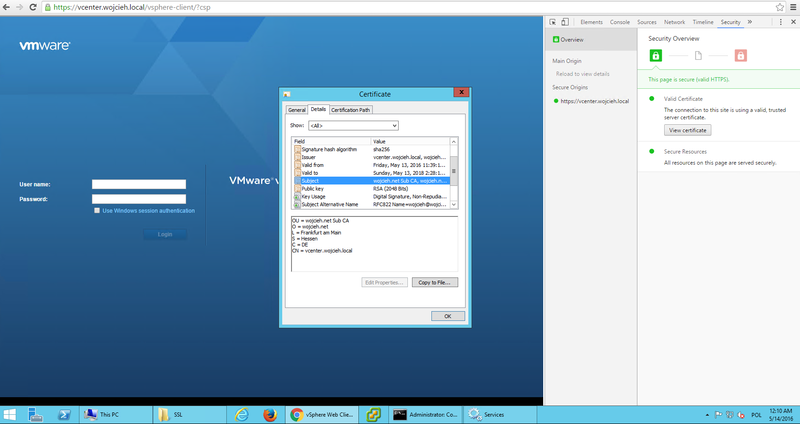 Once logged in to vSphere Web Client you can easily check that certificate was replaced. This post is quite long, but I hope it will be useful to all of those who can use VMware Sub CA in your environment. For those who have to use VMCA in custom mode you can simply follow my post how to replace SSL certificates with custom VMCA mode vCenter Server 6. * – Replacing SSL certificates with Custom VMCA. The vpxd.cfg is different than te rest on mine server. It asks for “Level id”(x2), “key_EvaluationExpiryDate” and “methods id”. Anny suggestions what you have to enter here? I wrote in post that we should be editing certool.cfg located in C:\Program Files\VMware\vCenter Server\vmcad directory. Anyway I checked internal pages for both values and I didn’t found then in correlation to certificate replacement. Perhaps you could send me screenshot or content of file and then I might help you. Thanx for your time to respond. Yes editing the certool.cfg was very clear and I did that. The file was used by the certification manger and worked. However when the script comes to the vpxd.cfg certool.cfg is used to answer different kind of fiels. I blurred some private information there. But the red parts are answers from the certool.cfg file. 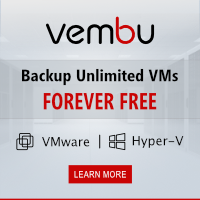 This server is upgraded from 5.5 to 6 (Version 6.0.0 Build 3617395). Did you ever resolve your problem with the “level id” field on the vpxd ssl cert? I am running into the exact same problem. Sorry but I was never able to resolve this issue. So far I know it has something to do with the upgrade instead of a clean install. Probably the easiest way to solve this is doing a new/clean install. We are planning that for our next upgrade to 6.5 and accept the certificate errors for now. I had the same issue as above, also on a 5.5 -> 6.0 upgrade. Glad I found this, I’ll open a VMware ticket and have it investigated. I had same issue. Resolution : correct corrupted template. Open C:\ProgramData\VMware\vCenterServer\runtime\tmp\vmware\MACHINE_SSL_CERT.cfg and edit (copy entry from certool.cfg or other *.cfg file in same folder) and then run “cert manager” again.